When walking through your kitchen space, a potential home buyer is going to notice your kitchen cabinets. Regardless of whether the cabinets are structurally sound, if they look old and worn, they aren’t going to make a good impression. At Abode Building Center, our kitchen cabinet contractors understand that you want your kitchen cabinets to reflect the thought you put into designing your home. Out of all your kitchen appliances and accessories, your cabinets will last the longest, which is why you want to trust your next remodeling project to a company that is known for providing high-quality cabinets. Below are five ways that new kitchen cabinets can add value to your home. When selling your home, two of the more important rooms to upkeep are the kitchen and bathroom. Since these rooms are more consistently used in a home, they are of most interest to potential home buyers. When selecting your new kitchen cabinets, keep in mind that you might one day have to sell your house. 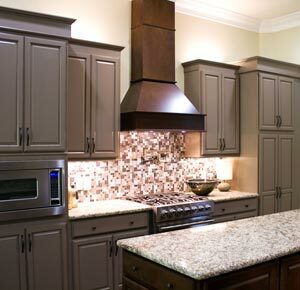 For this reason, homeowners should consider our more popular traditional style cabinets at Abode Building Center. Traditional style cabinets are compatible with many different kitchen atmospheres. It is usually best to match your kitchen’s decor with the design theme of your home. Continuing the interior design scheme of your home into your kitchen is a great way to achieve design continuity. Design continuity is what creates that natural flow throughout your home that makes your home more visually dynamic and cohesive. Kitchen cabinets offer invaluable storage options to the busy family or to the enthusiastic cook. At Abode Building Center, our kitchen designers understand that your kitchen is responsible for housing a lot of items which includes dishes, pots, pans, food items, and other important kitchen goods. We offer many different styles that maximize the storage potential of your kitchen. Having kitchen cabinets above your head allows for more floor space. Homeowners who don’t have adequate cabinet space in their kitchens suffer a disadvantage in terms of storage. Ultimately, quality kitchen cabinets are the superior choice, as opposed to shelving your items on small bookcases or letting them clutter your counter space. Custom kitchen cabinets not only hide clutter, but organize it so that you can always find what you need. When your kitchen is outfitted with cabinet installations from Abode Building Center, you can rest easy knowing that you’ve received a high-quality product. With our cabinets, you don’t have to worry about where to fit the kitchen overflow. Our cabinets provide everything that you need at your fingertips. At Abode Building Center, we do our best to meet our clients’ needs so that they can feel comfortable in their own homes. Part of that comfort comes from knowing that their home’s design is functional and fashionable. If you feel that your kitchen space would benefit from new kitchen cabinet installation, feel free to call our Portage kitchen remodelers at (248) 850-7178. Our kitchen contractors are always happy to help clients beautify their cooking spaces.